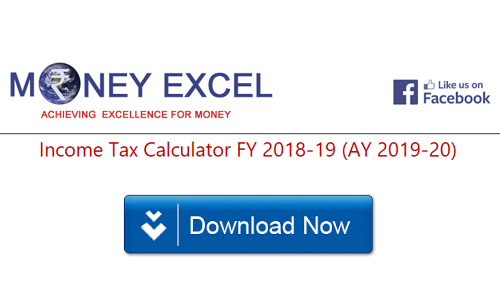 Download, check out simple Income Tax Calculator of FY 2018-19 (AY 2019-20). This calculator also includes recent changes made in Budget 2018 by Finance Minister. Income Tax Calculation is one of the most complex tasks for the common man. To simplify this task here is Income tax calculator for the financial year 2018-19. It is simple excel based calculator specially made for salaried people. Using this calculator you can calculate your income tax liability for FY 2018-19 (AY 2019-20). Prior to looking at Income tax calculator let’s take a look at Income tax slab for FY 2018-19 and recent changes made in Income Tax during budget 2018. As far as income tax slab is a concern, no changes are made in budget 2018. There are three income tax slabs for general category. Income up to 2.5 Lakh is tax-free. 5% tax is applicable for the income in the range of 2.5 Lakh to 5 Lakh. 20% tax is applicable for income in the range of 5 Lakh to 10 Lakh. For Senior citizen income up to 3 Lakh is tax-free and for very senior citizen income up to 5 Lakh is tax-free. Accordingly, Income Tax Slab for FY 2018-19 (AY 2019-20) is given below. In budget 2018 following income tax related changes are introduced. Standard Deduction is back. Salaried people will be allowed to enjoy Rs.40000 as standard deduction. This means for salaried people tax-free income is Rs.2.9 Lakh. The introduction of standard deduction is towards removal of an existing benefit of medical and transport allowance exemption. A cess applicable on tax is increased to 4%. Up to last year, taxpayers were paying 3% health and education cess on tax. This cess is increased to 4%. A senior citizen will be able to enjoy higher income tax exemption on interest earned from banks and post office. New section 80TTB is introduced and it will allow a deduction up to Rs.50000 in respect of interest income from deposits held by senior citizens. For general category section 80TTA, Rs.10000 deduction will continue. You can download new income tax calculator FY 2018-19 from the link given below. In order to calculate your income tax liabilities, you need to provide inputs such as your gross income, exemption amount. In addition to that, you need to provide information about the investment made by you under various sections. In the bottom section, you need to provide selection of applicable tax slab. You will be able to see tax applicable in Tax Liability section. Click on following image to download income tax calculator. This calculator is designed exclusively for salary income only. It is excel based calculator. You need Microsoft Excel in order to use this calculator. I can see Tax Credit option (Upto Rs. 5000 if Taxable Income < Rs. 5 lakhs) can you please tell under which section or subsection is this? I will try to modify calculator by adding marginal relief. the FY 2018-19 and FY 2017-18. Standard deduction of Rs 40,000 is allowed only for salaried taxpayers.No changes have been proposed by the Finance Bill 2018 in the rebate u/s 87A for AY 2019-20.